Ritual practices in the Philippines take a multitude of forms and take place on any number of occasions, reflecting the intentions that motivate the practice. There is a great range of variability in the degree of elaborateness and sophistication and in the way that they employ narratives and symbolic gestures. Despite the commonality of intentions and content, similar rituals may exhibit marked variations in the way certain elements are emphasized. It is not uncommon to observe differing versions from neighboring villages . Depending on the significance of the ritual and the potential beneficial effect it may have on the community, certain rituals can be performed simply and without much preparation. On the other hand, where the practice is performed for the benefit of an entire locality, the ritual may extend to period of weeks and involve the entire populations of several towns. Folkloric dance is often thought of as being a separate and distinct component of rituals. In practice, however, this distinction is not as clear cut. Oftentimes, the dance itself constitutes the ritual, and the movement and symbolic gestures are interpersonal and blended into the entire ritual performance. Ritual traditions of Filipinos are best understood in terms of their intentions. At the core of any ritual is the fundamental belief that there exists a delicate balance between man and nature, and the spirit world. It is believed that for good or bad, it is through the actions of man that this balance is shifted. Rituals can be interpreted as an attempt to enhance and maintain this balance. When the balance is lost, misfortune in various forms are visited upon the village and rituals must be performed to restore the state of affairs. Human nature, being what it is, there are innumerable reasons for causing a shift in this balance. Consequently, there are equally innumerable rituals through which this imbalance may be corrected. This helps explain the broad range of ritual practices in the Philippines. There are rituals to define the future, rituals to appease or propitiate spirits, rituals to ensure a good harvest, rituals to invoke protection from the unseen, rituals to carry guidance and counsel, rituals to heal the sick, rituals to bring good luck and rituals of every conceivable purpose. It would seem that every facet of Filipino life is linked with some kind of ritual practice. These are even rituals which are performed exclusively to determine the necessity for subsequent rituals. This, if anything, demonstrates the pervasiveness of rituals in folk culture. As a general rule, where there are rituals, there are dances. 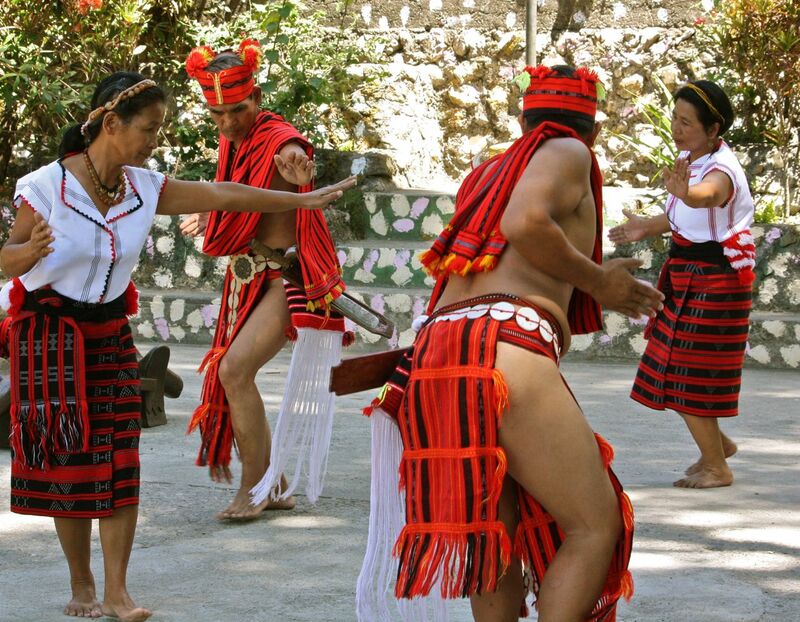 For the Filipino, there is no higher symbolic form than a dance. Transcendent of the spoken language and laden with the most profound emotional content, dance represents the distillation of collective memory, affect, religious piety, humility, and purity of intention. When the message is so complex, it is at times articulated in a dance. In addition to its religious significance the performance of a ritual provides an important occasion to reaffirm social roles and expectations and to validate village hierarchies. The persons who initiate and lead ritual dances are those who hold the collective knowledge of the village, a role that commands the highest respect and is accorded the highest status. Differential regional histories may partly explain the diversity of ritual forms in the Philippines. Although the Philippines was a colony of Spain for over 300 years, the archipelago nature of the country prevented complete homogenization of the different island regions. As a result, there are numerous areas where pre-Christian traditions survived fairly intact. Well before the arrivals of the Spaniards, Islam had long taken deep root in the southern island of Mindanao and the rituals of the region contain some forms associated with the mystical practices of Islam. Rituals in the lowlands are characterized by a blend of Catholic traditions woven into pre-Christian and traditionalist beliefs. This mixture has resulted in a version of folk Christianity which is uniquely Filipino and extremely varied in its manifestations. At the core of rituals is a need to clarify and define a sense of place in the universe. The roles of mankind and those of spirits are articulated through drama and elaborate symbolic gestures. The ritual typically amplifies well- known narratives drawn from a shared collective history which illustrate the contractual obligations governing the relationships between mankind, nature and the spirits. Through gestures, incantations, trance states, and use of symbolic implements, practitioners invoke the reciprocal exchanges which regulate the dynamic balance between men and spirits. In this context, rituals have two intended audiences. First, there are the spirits, who are called upon to witness and participate in a re-enactment of a sacred agreement between mankind and the unseen and who are being reminded of their obligations to provide for the well-being of those in the physical world. By witnessing the ritual, spirits are placated, and assured of their influential position over the affairs of man. The community of ritual practitioners activate the second audience. By preparing for and in carrying out the ritual itself, villagers are given the opportunity to reflect upon a body of collective knowledge accumulated and refined over the span of generations. The dramatization and the use of symbolic narratives intensify and reinforce values and beliefs, and provide a sense of generational continuity. In effect, the performance of ritual dances is an act of recollection. The process serves as a reminder for both men and spirits of their responsibilities to each other , and within the ritualized tableau is an understanding that in recollecting the significance of the past, participants are better prepared to accommodate the uncertainties of the present. About the Author: Ramon Obusan earned his degrees in fisheries technology and cultural anthropology at the University of the Philippines. In 1971, he founded the Ramon Obusan Folkloric Group, and has since choreographed and directed for some 65 dance groups and over 100 productions nationwide. His productions include full-length presentations like "Under the ASEAN Sky", "Philippine Festivals", "Tausug Tapestry" and the "Rare and Unpublished Dances" series.He was given the Patnubay ng Kalinangan award by the City of Manila in 1992 and the Gawad CCP Para sa Sining in 1993.